How much cable will you need? Ships Same Day: The item in stock and will usually ship on the same day that your order is placed, as long as the order is placed Monday-Friday before 4 p.m. Central Time (3 p.m. Eastern Time for Canadian orders). This excludes holidays on which carrier service is not available. Orders placed after the shipping cutoff time will be fulfilled on the next business day. Your credit card will not be charged until your order is ready to ship. Advance Order: The item is currently being restocked and is available for advance order. Call us at 800-875-5285 for a shipping-time estimate. Your credit card will not be charged until your order is ready to ship (except for custom made products). For additional information, please visit our Detailed Shipping Policy and Return Policy. Add the safety and convenience of a snow melting system to stairs, curved walkways, and other layouts featuring unusual dimensions. 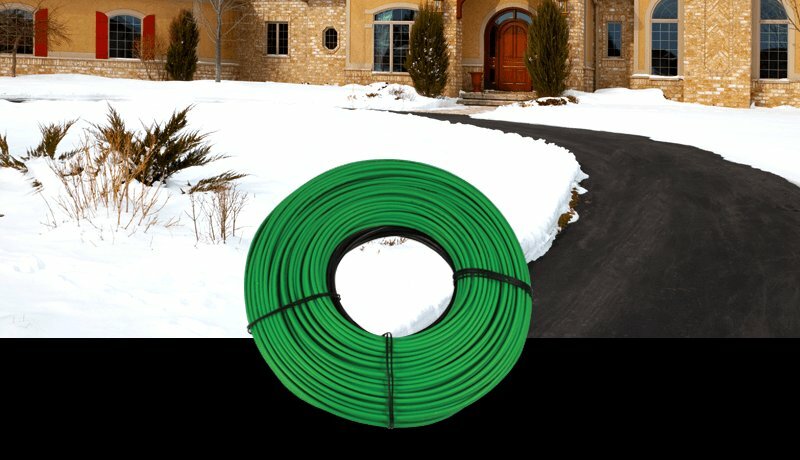 This 251′ 240 VAC snow melting cable from WarmlyYours generates 12 watts of radiant heat per lineal foot to remove snow and ice from concrete, asphalt or paver surfaces. For use in either residential or commercial installations, this twin-conductor cable measures just ¼” (6mm) in diameter and includes 20 feet (6m) of 14 AWG cold lead to meet the requirements of any installation. All WarmlyYours snow melting cables are CSA certified for outdoor use in Canadian and U.S. markets. Feel free to chat us if you have any questions about which accessories would be best for your system. Watts Per Sq. Ft. Up to 50 Watts per Sq. Ft.
Will the snow refreeze into ice once melted? All of our automatic controllers have a Hold-on time feature after the initial warming up of the snow melt system. This feature ensures that all the snow is melted from the surface, and also that the system continues to operate and evaporate the surface water without it refreezing. How quickly do these systems melt the snow? These systems are designed to melt 1" - 3" of snow per hour on average. Anything above 3" per hour is typically considered blizzard conditions. 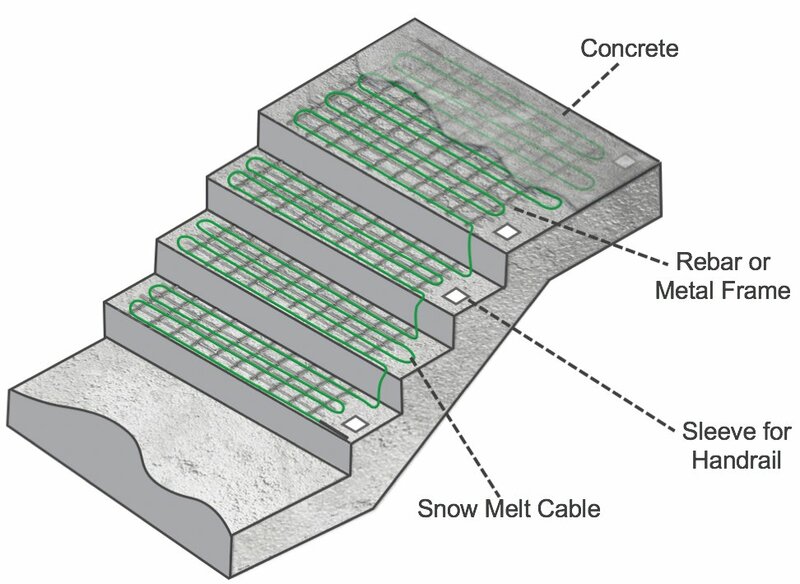 What is the lowest temperature that a snow melt system can handle? Our systems can handle low temperatures, but most controls come equipped with a Low Temperature Lockout Feature. This feature prevents the system from running by default in temperatures below 17F. At temperatures this low it becomes difficult for the system to effectively melt the snow. It is however possible to turn off this feature should you need the system to keep running during such low temperatures. What type of conduit should I use to bring power to the heating cables? 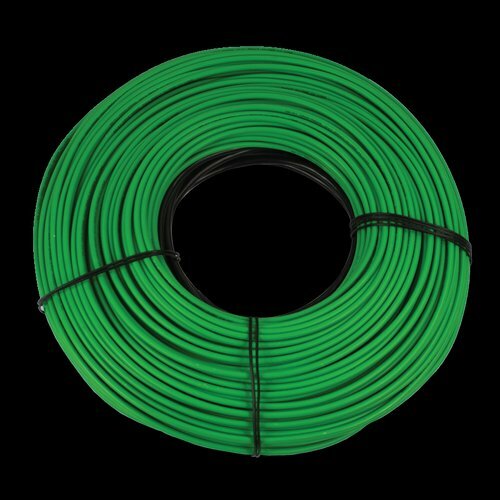 Each heating cable comes with a factory installed cold lead wire that must be routed through the rigid metal 3/4" conduit to a outdoor rated junction box where a simple wire nut connection can be made for the electrical hook-up. Will I need a new / expanded electrical panel for my snow melting system? Always confirm the power requirements with the electrician. Large snow melting systems usually require a new electrical panel or electrical service. Contact WarmlyYours for a quotation, indicating the actual power capacity available, and to obtain recommendations for reducing the power consumption. 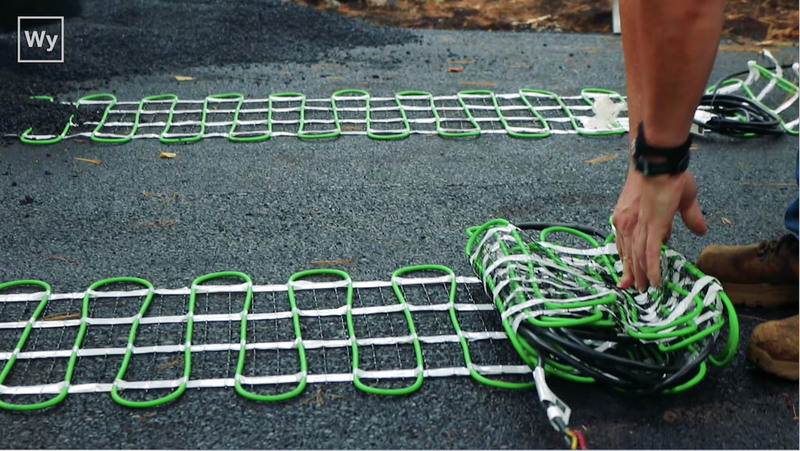 For example, opting for tire track coverage rather than installing the snow melting system over the entire driveway can dramatically reduce power requirements. How much power does the snow melting system use? Power requirements are measured in Amps and based on three factors: the watts per sq. 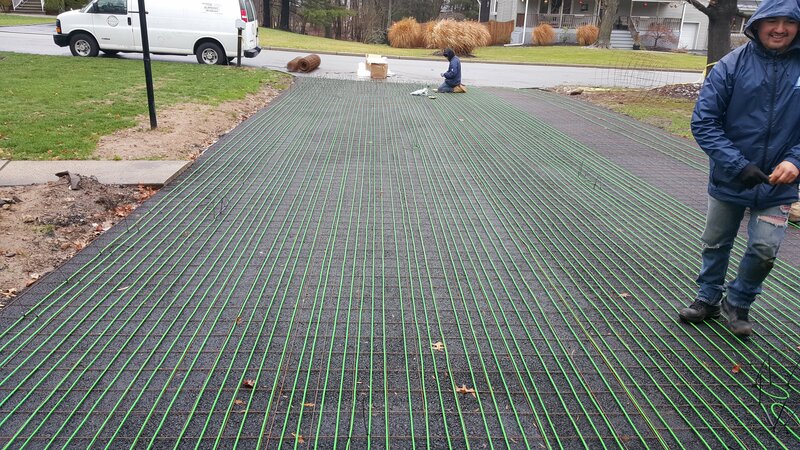 ft. of the snow melting cable or mat, the area powered and the voltage used for the application. Our product is rated at 50 watts per sq. ft., so that is a constant factor. Most snowmelt projects are powered with 240V AC – not all, but most. The one factor that is always variable is the area to be heated/powered. That is based on your project. For a point of reference, let’s use the example above of a 350 sq. ft. concrete patio. How much does the snow melting system cost to operate? To calculate the system's approximate operating costs, multiply the total kilowatts of the system by the cost per kilowatt in your area. Let's use the example of a 350 sq. ft. of concrete patio (residential application), with 240 VAC. 17,500 Total Watts / 1000 = 17.5 Kilowatts. Kilowatt Rate: use the national average of .12 cents per Kilowatt-hours so how much do we pay for 17.5 kWatts? 17.5 kW x .12 = $2.10 for every full hour of operation. Hours of Operation: We use a typical 6 hour snowfall for our example. $2.10 x 6 hours = $12.60 for that snowfall. All of this will vary due to "after-run time". 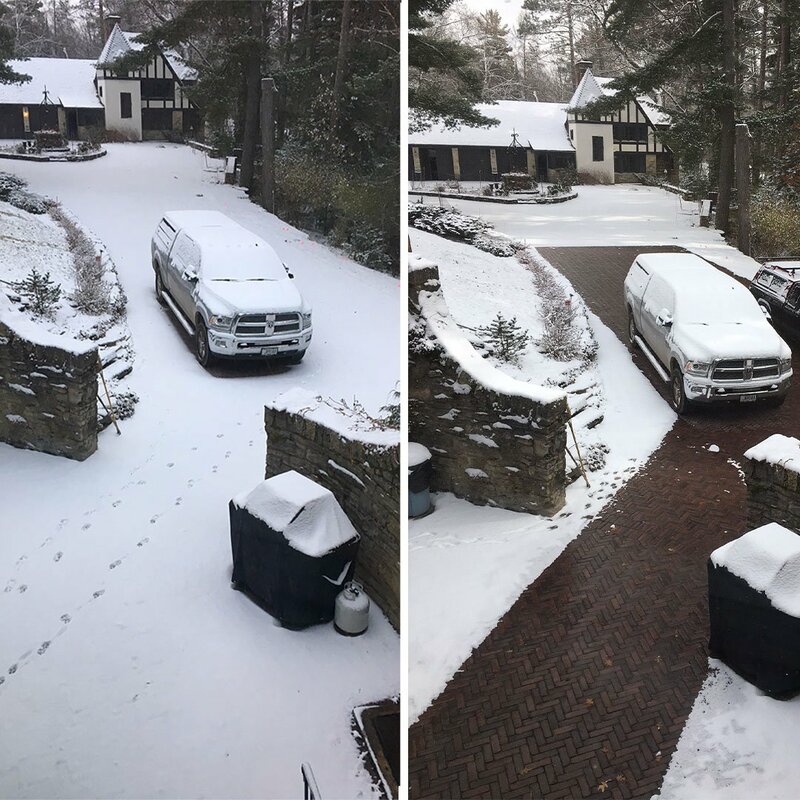 "After run time" is where the system remains on extra hours after the snow has completed falling, to ensure complete pavement snow melting and drying. How much does a snow melting system cost? A snow melting system typically costs between $7.00 and $15.00 per square foot, not including a control. Control packages range from $250.00 and $1,500.00 per system. What happens if the cable is damaged during the installation? If a cable is damaged during installation, recheck the system for continuity and confirm the integrity of the insulation with a megohmmeter, or "megger" tester, referring to the installation and testing instructions. If the cable fails any of these tests, take the following actions: clear a 3 foot square working area around the damaged section of cable, and record the cable part number from the UL tag and the location where you purchased the product. Call WarmlyYours with the above information. WarmlyYours will provide further assistance and supply a splice kit suitable for repairing the particular cable. May I cross or overlap the heating cable? Never cross, overlap, or allow the heating cables to touch each other. Doing so will quickly cause a circuit failure due to excessive heat build up. Always follow the product instructions and/or design layout plan to ensure the cable is installed with the correct spacing required for proper operation. May I cut the cold lead wires? The electrician may shorten the cold lead wires during the installation. Any lead wire extensions/splices must be made in a junction box in accordance with the installation instructions, and must comply with all national and local electrical codes. Never cut the heating cable. Can I cut the heating cable if it is too long for the application for which it was designed? Never cut the heating cable. A heating cable will not work if it has been cut. If the heating cable is too long, call WarmlyYours to consult with a technician who will guide you in utilizing the additional length of cable. 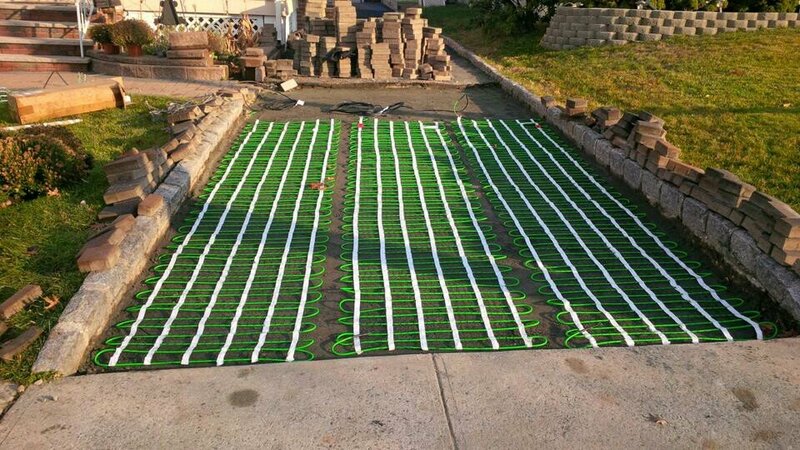 How does the electric snow melting system compare to hot water tubing (hydronic) systems? The material costs are similar. However, electric systems are easier to install, with fewer components and significantly lower maintenance costs. Electric systems will run for a shorter period of time to give the same level of performance but with much higher energy efficiency (typically 95%-98% efficient). Controls and sensors required for the two types of systems are very similar. 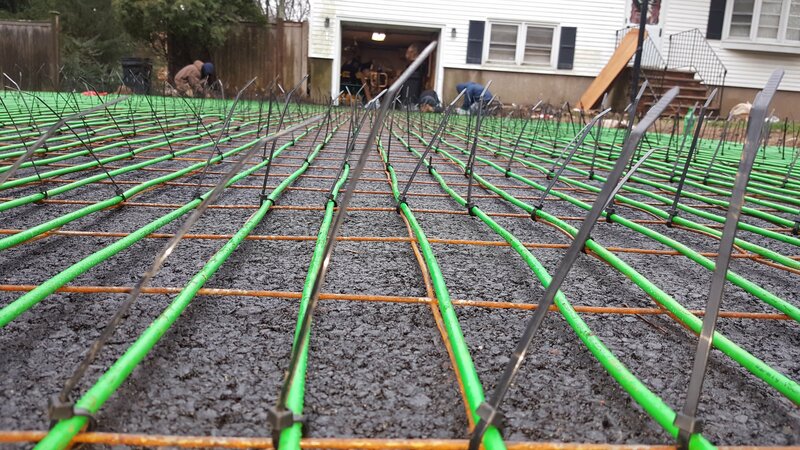 Electric systems do not usually require slab insulation and do not create the concerns typically associated with hydronic systems. These concerns include, but are not limited to, return temperatures, flue gas venting, waterway shrinkage and property damage caused by leaking pipes or tubes. Snow Melt Cables achieved an average rating of 5.0 stars with 5 reviews by our customers. Buried in blacktop driveway to provide clear path from house to garage. Works perfectly! Great product. Easy to Install. Customer Service is Awesome! Great product. It is easy to install and works great. The customer service as awesome and delivery was faster than ordering from a local dept store. I will buy more when the cabin is ready for flooring. As a DIY, I really appreciated the snow melting cable because it is so heavily jacketted I had no trouble with damage, testing the cable before and after proved that it withstood whatever it had to during installation. I love that it has a built-in return connection; meaning the cable doesn't have to make the "run" back to the relay panel - this made the install so much easier. The amount of cable you’ll need depends on the heat output and amount of heating coverage you want, both of which are impacted by the spacing of the heating cable. 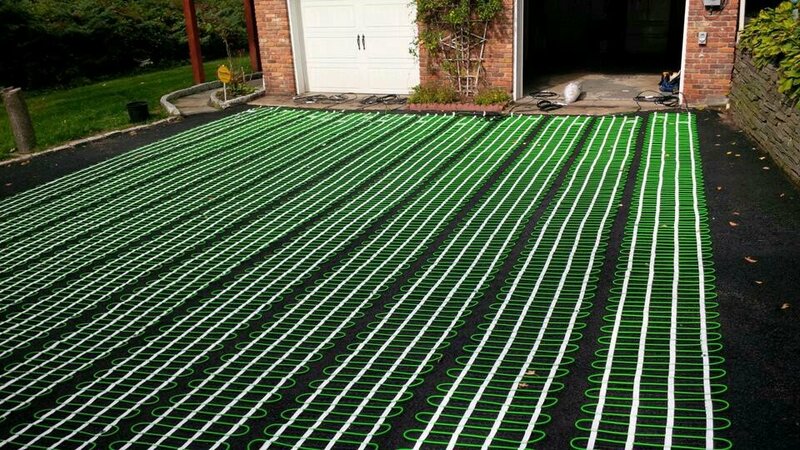 The recommended spacing for snow melting cables is 3", which will provide a heat output of 48-watts per sq. ft.